Japanese Tea Story : Cinnamon Apple Tea plus Custard Flavor make.....!? Cinnamon Apple Tea plus Custard Flavor make.....!? A snack food "Pocky ("Mikado" in some countries) " (by Ezaki Glico) is one of the most popular snacks in Japan. A bottled black tea named "Afternoon tea"( by Kirin Company Limited) is the most popular RTD. Last month, their collaborative project has released. 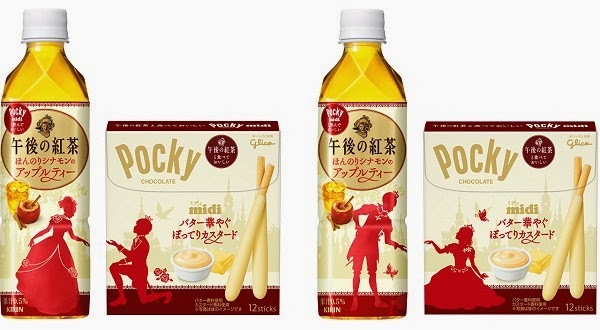 The Ezaki Gliko put "Custard flavor 'Pocky'" on the market , while Kirin Co.,LTd did "slightly cinnamon flavored apple 'Afternoon Tea'". According to those companies, when you eat together, which mean eat the Pocky and drink the tea, you will feel the taste of Apple Pie in your mouth. Moreover, the packages are so cute! When those two are lined side by side, you can see the picture that "a prince takes a princess hand". I haven’t tried this harmony yet, so I am not sure how much I can get the taste of “apple pie”, but I am sure that’s an appealing idea to many customers.